I've bundled my top, best-selling poetry resources. 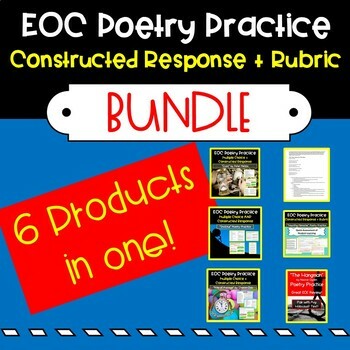 You'll receive 6 unique poetry exercises - all including multiple choice + constructed response questions. I've also included an answer key for each product. When Purchased Individually, these products would total $10.75. When bundled, you'll pay only $8.00 - a 20% savings! This is a quick and easy poetry practice where students read the poem, "Rite of Passage" by Sharon Olds. This could be used as a stand alone lesson plan, an EOC prep activity, or a simple and fast assessment after a unit on poetry. This is a quick and easy poetry practice where students read the poem, "Scars" by Peter Meinke. This could be used as a stand alone lesson plan, an EOC prep activity, or a simple and fast assessment after a unit on poetry. his is a quick and easy poetry practice where students read the poem, "Invictus" by William Ernest Henley. This could be used as a stand alone lesson plan, an EOC prep activity, or a simple and fast assessment after a unit on poetry. - 10 multiple choice questions covering the following skills/standards: tone, theme, thematic support, context clues, imagery, symbolism, literary devices, inference, and text structure. I use this quick assessment to check for my students' understanding of poetry AND writing a constructed response. I've included the poem, "Haunting Memories" by Jacqueline C. Nash for students to practice their constructed response writing. This poem will work for any Holocaust Text! I also use these activities as EOC prep for my tenth graders. Students are prompted to think critically about poetry while exploring universal themes. A culminating activity provides students with excellent test prep! - Detailed critical thinking questions to break poem into "pieces"